Have you ever eaten something so sweet that you get a hangover from the amount of sugar in something? If not...you should try a Havanna Alfajor Cookie - Sweet and flaky cookie filled in the middle with dulce de leche dusted off with powdered sugar. I'm not sure if they sell these in the states. My coworker Dan just recently came back from Argentina and was very nice to bring back a box of Havanna Alfajor cookies. I was ecstatic! From my experience, I have only eaten these when people have brought them from Argentina. The last time I had one of these cookies was 10 years ago tutoring a girl whose grandma would ship them boxes of beautifully wrapped havannas. The cookies are wrapped in elegant gold and silver wrappers. Silver wrappers are the cookies dusted off with sugar (shown above). Gold are the cookies dipped in chocolate. I personally prefer the powered sugar ones because they taste light, fluffy, and sticky all at once. When you take the first bite, the cookie crumbles all over you and your mouth is stuffed full of powered sugar, sticky sugar, and crystallized bits from the cookie dough. It's pretty powerful. The chocolate covered ones remind me of orion pies. The combination of the chocolate and dulce de leche is much too chewy for me. The chocolate over powers the dulce de leche...which for me is the whole point of the cookie! I will admit that I may have taken one or two more than my other coworkers today. I definitely had a sugar migraine for most of the afternoon and after eating my second one of the day, I seriously considered calling my dentist to schedule a teeth cleaning. 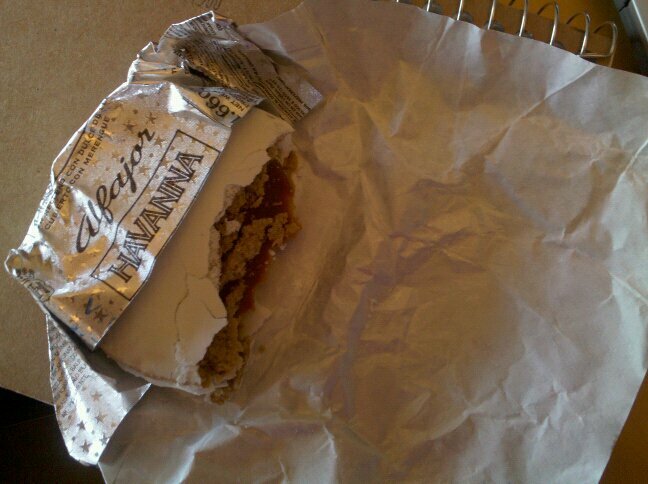 I woke up this morning as an Alfajor neophite, today I have graduated to becoming a connoisseur! Totally in love with these things and so glad to know that they're easy to find all over Miami where I live.